Witsies bounce back from semi-final loss to win third place in the Johannesburg Volleyball Union Women’s League. 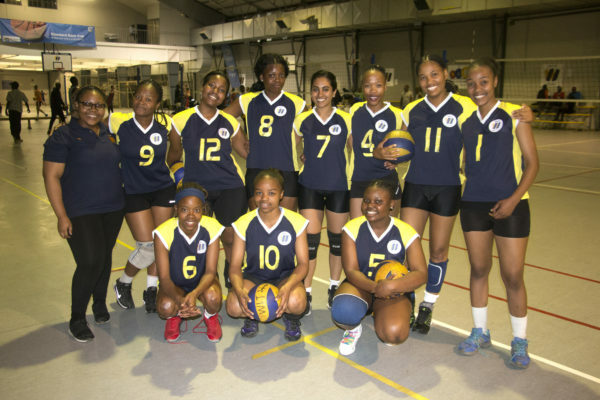 THE WITS women’s volleyball team clinched third place in the Johannesburg Volleyball Union Women’s League on Wednesday, September 26, after beating Spiker-Roo by three sets to one. With University of Johannesburg and Quantum set to play in the final, both Wits and Spiker-Roo were determined to achieve bronze and showed immense team spirit. After every point scored in a set, the teams could be heard chanting their team names as they formed a circle to celebrate before a ball was served again. Even if a point scored was not their own, both teams would huddle in a circle and keep their team’s spirits going. Wits won the first set after being the first to score 25 points but fell short in the second set. It was a tight second set with the scoreboard reading 25-25 but Spiker-Roo stole the set with a two-point lead resulting in a 25-27 set loss for Wits. Gabisile Cele, a second-year chemical engineering student, usually plays on the Wits team but was a supporter at the game. “I feel like we’re having an okay game. We’re not at our best but we’re playing against a team that isn’t that good so our performance isn’t that noticeable,” she told Wits Vuvuzela after the second set. Wits came back in the third set with a 25-18 win and the scoreboard in the fourth and final set read 25-12 to the Braamfontein team. After one-and-a-half hours of play, the bronze was in the bag. Lenah Fatah, the Wits coach, said she was proud of her team’s performance in the league. “Tonight’s game was much better than previous games. They were relaxed and calm and when they are like that they play much better. Only a few mistakes here and there but that’s normal in any sport,” she said. Malerato Kiangi, a player on the team, said that the team had improved since their loss against Quantum in the semi-finals. “I think we had fun in the game tonight and we were focused even though we lost in the second set,” said the 36-year-old. The team’s next game is a friendly against the American International School of Johannesburg on Saturday, September 29.